A schematic of the new Advanced Manufacturing building at Lawrence Livermore. Lawrence Livermore National Laboratory and National Nuclear Security Administration (NNSA) officials, along with representatives from local government and industry, broke ground Friday on the Advanced Manufacturing Lab (AML), a modern collaborative hub for developing next-generation materials and manufacturing technologies. 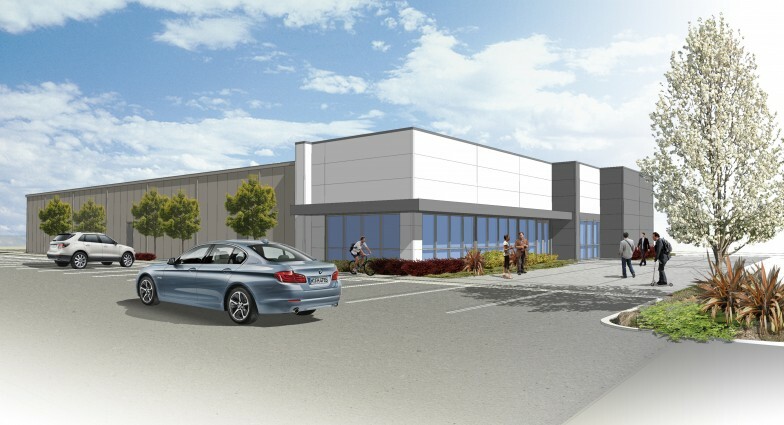 The $9.4 million, 13,000-square-foot facility will be located in the growing Livermore Valley Open Campus (LVOC), and will feature two laboratories (a reconfigurable "wet" chemistry lab and a "dry" instrument lab), a collaboration space, conference area and support rooms with a potential for future expansion. The target completion date is mid-to-late 2017. The AML's cutting-edge capabilities and open location will provide a space where LLNL employees can work side by side with industry and academic partners to advance research and development and create a pipeline for the future workforce, LLNL Deputy Director Tom Gioconda said. "This new multidisciplinary lab in LVOC will provide a hub for (science and technology) development, which is important for the future of the Livermore Lab, as well as a vibrant research environment for the commercial sector," Gioconda said. "This is one of those moments in time where 10 years from now, you will look back and say, 'I was a part of that.'" Expanding on LLNL's existing infrastructure and expertise in materials science, engineering and additive manufacturing, the AML will combine high performance computing, modeling and simulation to rapidly advance research into emerging manufacturing technologies, Gioconda said. The technologies that will be explored in the facility could apply to national defense, energy security and nuclear deterrence and help ensure economic competitiveness and job growth, Lab officials said. A culmination of a vision nearly a decade in the making, the AML also will usher in a new era of on-demand fabrication of materials and parts previously unattainable through conventional means, said LLNL's Associate Director of the Physical and Life Sciences Directorate Glenn Fox. "Newer technology is radically changing the time and materials we can use with manufacturing," Fox said. "The AML is a flag post showing what we can bring nationally...It will provide a new forum to collaborate with industry, academia and our other partners." Once finished, the AML (Bldg. 655) will contain two 5,000 square-foot laboratories, a 2,000 square-foot office area, a multimedia conference room for up to 22 people, a kitchen and break area, restrooms, a collaboration area and separate computer workstations. A 120-foot-long observation corridor will divide the two labs, allowing tour groups to observe the work. The AML also will be the first new building at the Lab with a LEED Gold certification. The AML is part of an effort by NNSA to modernize the agency's manufacturing infrastructure, with the goal of reducing risks, time-to-market and production costs. Pete Rodrik, technical deputy for the NNSA's Livermore Field Office, said approaches developed at the facility would showcase the Lab's commitment to meeting its mission needs, and increase its ability to retain and attract scientists and engineers. "We are excited to see the landscape of our Lab expand," Rodrik said. "These facilities represent the transition of concept to reality." Charlie Verdon, LLNL's principal associate director for Weapons and Complex Integration, added that advanced manufacturing shows "significant potential" for the Lab to fulfill its mission goals by providing new ways to approach problems and opening up previously unimagined regions of design space. "By leveraging the technology we're developing, we will help out not only national security, but America in general," Verdon said. "That is our hope and vision for this facility -- to enhance our ability to fulfill that need." The AML builds on years of experience the Lab has had in additive manufacturing, which has grown to include six laboratories and resulted in development of more than 10 prototype processes and tools that are not yet commercially available, as well as more than 40 patents, according to Engineering Associate Director Anantha Krishnan. By incorporating high performance computing, modeling and simulation to optimize and refine processes and tools, Krishnan said, the Lab has been able to produce components for national security purposes in weeks to months, instead of the several years it took to design and produce such parts through conventional manufacturing approaches. "We're already seeing significant decreases in manufacturing cost and footprint, improved flexibility and products and components that are vastly superior to those obtained through traditional manufacturing," Krishnan said. "We're viewing (the AML) as a way to rapidly develop future technology and capabilities through collaborations with industry and academia." LLNL's Additive Manufacturing Initiative Director Chris Spadaccini, who will oversee the work conducted in the new facility, added, "The new AML is an exciting step forward in our materials and advanced manufacturing portfolio. It will better enable us to work with industry and academia to spin out Livermore-developed technologies while simultaneously learning from some of the best groups in the external community." Through its additive manufacturing initiatives, LLNL has collaborated with numerous industrial partners, including FATHOM, an advanced manufacturer established in Oakland. FATHOM Co-Founder and Principal Rich Stump said the AML could lower the barrier of entry for small companies and spur adoption of additive manufacturing in high-value industries such as medical and aerospace. "By developing new materials and processes, it allows for the technology to be driven into commercial applications," Stump said. "We can put people here and access the Lab's expertise, the tools, the knowledge, and combine it with our knowledge of industry to be able to identify and solve those commercial problems." Local dignitaries at the event included Dublin Mayor David Haubert, Danville Councilmember Karen Stepper, Livermore Community Development Director Paul Spence and Roderick Hirsch, director of the Oakland Export Assistance Center, U.S. Department of Commerce. Representatives from the offices of Congressman Eric Swalwell, State Sen. Steve Glazer, Assemblywoman Catherine Baker and Alameda County Supervisor Scott Haggerty also attended.